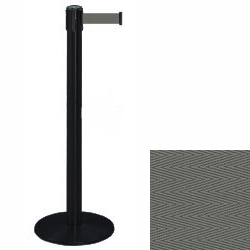 This black stanchion w/ gray belt is most effective when stretched no more than 7 feet. The retractable satin rope measures 7.5 feet long. 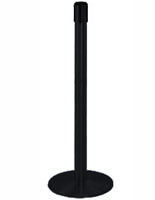 This Tensabarrier stanchion w/ gray belt for crowd barrier systems queues lines with a 2" wide satin rope. 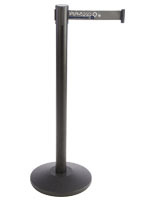 The 38"h retail fixture is easy to move, weighing just 24 lbs. 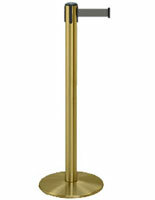 A 13 1/2" diameter base is weighted and stable in high traffic. 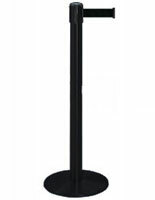 Each of these stanchions w/ gray belt subtly directs visitors through a line at the movie theater, in a hotel, or in a ticket line. 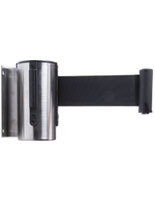 For higher traffic venues, we recommend using Dual Belt Posts. For more assistance regarding layout options, click here designing crowd control systems.